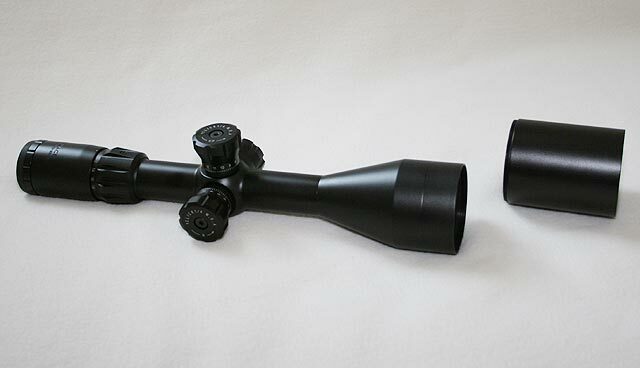 We have reviewed a couple of the Falcon scopes before, both the Merlin 10×42 and its replacement, the Menace 10×42. Falcon has additional scopes in their Merlin lineup that are geared more toward hunting, but they are also now just bringing out their variable power Menace lineup which includes a 4.5-18x56mm and a 4-14x44mm Front Focal Plane (FFP) model. The one we are reviewing here is a preproduction 4.5-18x56mm model. This 4.5-18x56mm version of the Menace scope appears to be a good solid scope that shares a few of the same features as the 10×42 model. But in reality the scopes are considerably different. Of course, the two most obvious being that the scope is a variable power and the objective lens is considerably larger. The scope tube itself appears well made with a nice even matte anodized finish. 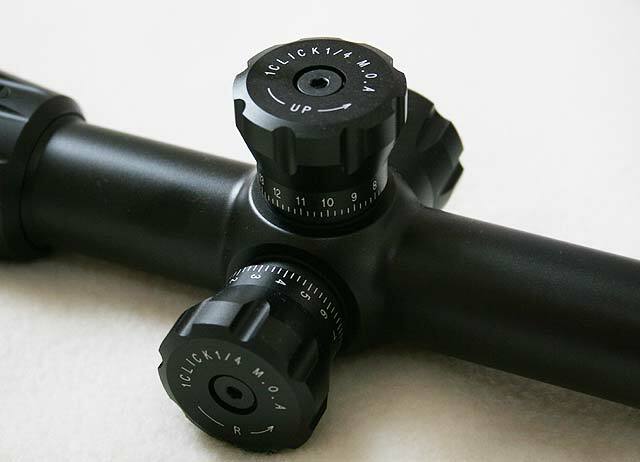 The multi-piece aluminum tube is nicely shaped and as on the other Menace scopes, there is a fairly large fast focus adjustable eye piece (diopter adjustment). The tube on the 4-14×44 version is a one piece tube and this one needs to be as well. We have seen several failures of these 4.5-18x56mm tubes at the junction where the bell meets the tube. Falcon is in the process of changing the tubes out to be a one piece design and that should happen in mid 2009 and will help. The eye piece has a nice rubber ring to help prevent injury if the shooter gets too close to the scope when firing, but there is only 3″ of eye relief available which will make that rubber ring very important. All of our test firing was done with a 308 win 700P heavy barreled rifle and there was no problem with eye relief for us, though admittedly, it is not a heavy recoiling rifle. The scope comes with a 3″ Sunshade which is a nice Menace feature that you do not have to pay extra for. 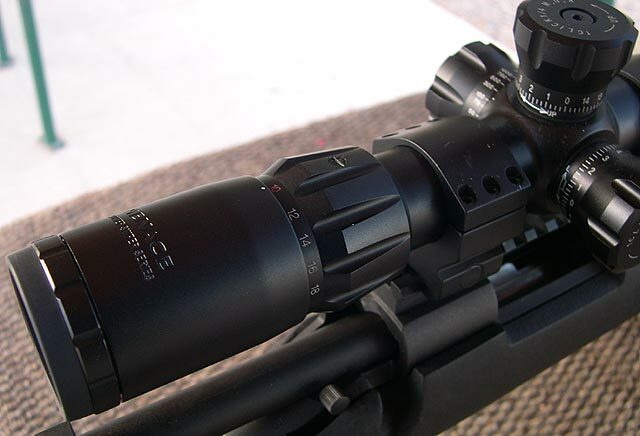 Like the other Menace scopes, the lenses are sourced from Japan and are made to a specified Falcon standard. The lenses are all truly multi-coated front and back with a claimed 92+% light transmission. The tube and the majority of the assembly are sourced from China and final assembly and quality control happen at Falcon Optics in the United Kingdom. The overall quality on the Menace scopes have been good with the ones we have dealt with and this one appears the same. Yes, I wish there were no parts sourced from China, but it appears to be working for Falcon and how they do it. The knobs are the same that are found on the 10x42T Menace and are a good design. There are directional markings on the scope that indicate which way is up/down as well as left/right for those stressful times when your mind might need a quick reminder. There are horizontal hash marks for the elevation knob to indicate how many revolutions you have gone with the elevation knob. A change from the 10×42, and perhaps because there is not as many revolutions of adjustment, when the elevation knob is bottomed out, you can still see the bottom most hash mark. 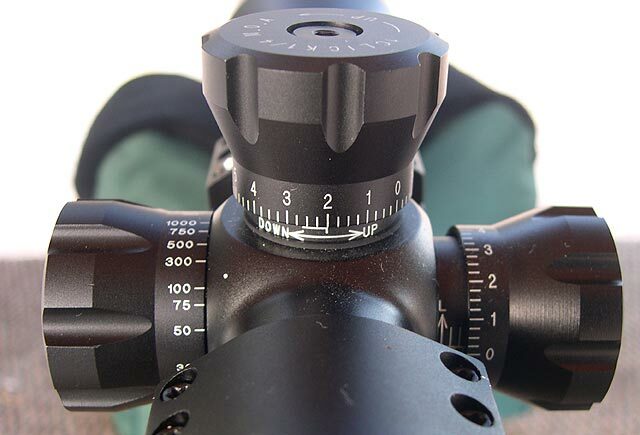 The windage knob also counts up in both directions which is a feature I like in tactical scopes and with 15 MOA per revolution, it counts up to 7 in each direction, after that they overlap. Falcon specifies 80 MOA of vertical adjustment and that was exactly how many our scope had. This should be enough to get a 308 zeroed at 100 through 1000 yards depending on the mounts you use and how much elevation you burn when zeroing. But even if it was tight a nice 15 or 20 MOA base would give you plenty of adjustments. The knobs are attached using a single Allen screw on both the windage and elevation knob. To “slip” the rings you remove the screw, lift the knob up and then reattach it on the “zero” mark. The knobs have a good audible click but this Menace model also has mushy and soft tactile clicks which are lost if wearing gloves and there is a fair amount of play before the audible “click” happens. The mushy clicks are something we do not like on these scopes and does not give me a good feeling they will hold up over time. The adjustments are 1/4 MOA per click in both elevation and windage. The side focus, or parallax adjustment, is of the same design as the other knobs. The markings on the knob go up to 1000 yards and then to infinity. We have noticed that the Menace scopes come with some pretty stiff adjustments that tend to “break-in” over the first little while, and that was the case with this scope as well. The elevation knob has loosened and is very nice, though the windage is still a bit stiff and will need a bit more use to break it in. We are not sure why they are this way or if it is a good or bad sign. The power ring has knurled serrations on it as well to allow for better gripping and while it is a bit stiff it is smooth all the way through the adjustment range. The markings are in white except for the 10x marking, it is in red to indicate that is where the mildot reticule is accurate at on this second focal plane scope. You cannot see the power markings while behind the scope, so if you are zooming in and out and then need to be at the 10x mark for milling, you will need to raise your head to see when you are there. The eye piece does NOT rotate with the power ring which is a good thing and the fast focus eye piece is still the same and works well. The scope has the new Enhanced Skelton Long Range (ESLR) mildot reticule which has standard mildots as well as half mil hash marks to aide with more accurate measurements. There is no documentation on the use of mils or anything else for that matter, so familiarity of mil-dots is good to have, but of course, you do not have to know mils in order to use the scope effectively. I would prefer the thick part of the statia lines to be solid and not skeleton to help with picking up the reticule in low light conditions or with complex dark backgrounds. But the reticule does work and the half mil marks are a good addition. The mildots also extend 10 Mils below the horizontal hash mark which I think is a good thing for both measuring targets as well as when using the reticule for hold-overs. Each lens is fully multi coated front and back and optical performance appears to be good with a bright and clear picture even in dusk/dawn conditions especially with the larger 56mm objective which helps gather light. I had the scope out at the range next to a Leupold Mark 4 6.5-20x50mm and did a side by side in the same early morning conditions. I would give the edge to the Leupold optics, but the Falcon did perform well and had good light gathering with that larger objective. Going from a 40mm to 50mm objective lens gives you 50% more surface area to gather light with, which is worth it in most cases. A 56mm has about 25% more surface area than a 50mm, which I’m not sure its worth it. I personally prefer the 50mm objectives to the 56mm simply for scope height mounting concerns, but 25% more is a significant amount. It is a personal preference that you will need to make, all I can say is that the optical performance and low light capability is good. When taking the scope to the range we mounted it on top of our 700P test mule rifle which has a Warne one piece rail on top. 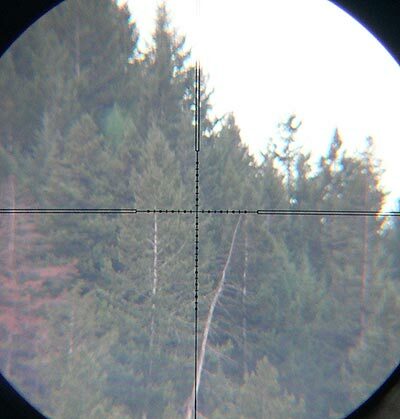 We mounted the scope with Burris XTR 30mm rings, but I was surprised to see that medium height rings was plenty of height to give plenty of clearance off the barrel. I was also surprised that I was not “goose necking” nearly as much as I thought I would with the scope mounted high for the 56mm objective. An Eagle cheekpiece would make it just about perfect. At the range the scope performed very well with easy focusing on the various targets at different ranges and in different light conditions. We took it out on an early morning with overcast skies and the scope performed well with light gathering as I indicated above. The temperature was about 25 degrees Fahrenheit. The adjustments were also easy to use and read; though the knobs probably don’t have quite as good a gripping surface as some of the other large style knobs, perhaps a few more serrations to give smaller knurled sizes would do that trick. The adjustments were precise in all the shooting exercises we performed. Shooting the box showed excellent repeatable adjustments and I could not find any real fault with the scope beyond the short eye relief and non confidence inspiring clicks. I even fired a box test at different magnifications between 8x and 18x at the different points on the box, with excellent results. It appears that repeatability is very good on the adjustments and magnifications on this test scope. I hope that is indicative of all production scopes. As with the other menace scopes, the cheap flip up scope caps that come with the scope are worthless, just buy some butler creeks. These Falcon scopes are a good offering for this price range and the variable power ones seem to carry on the same traditions as the fixed 10×42 model. 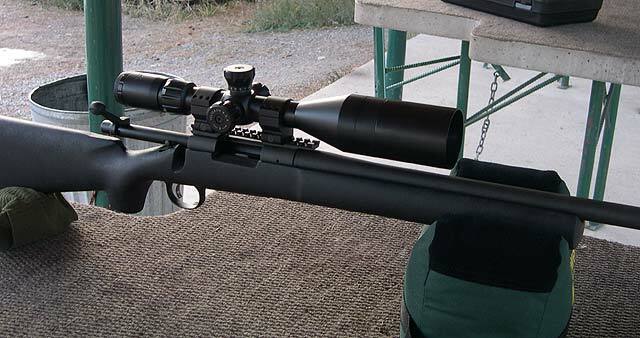 Good solid tube, good optics with good light transmission with very good repeat adjustments as a good price. It seems to be a good formula and provided are no long term issues they will work very well. It is a very good scope and provided the durability holds up, which I have no reason to doubt; these scopes are a very good option for that $400 tactical scope range. Update 2010 The durability of these scopes did not hold up as well as hoped. The two piece tube was a major problem but Falcon has reportedly switched to a one piece tube. There were some other issues with canted reticles, flakes on lenses and other problems that we have seen on other Chinese sourced scopes as well. Falcon has readdressed their scope lineup recently with updated models and new features and they now have a better capable source for handling any warranty claims with SWFA acting as the main USA contact point.